A past Baja car in the Student Design Center. 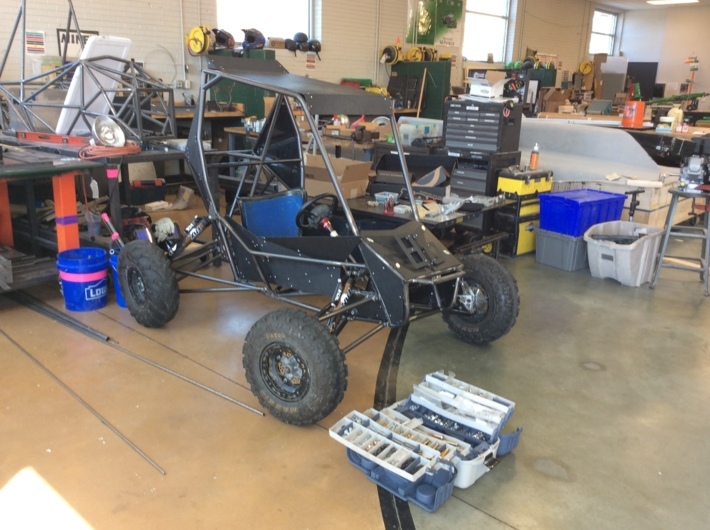 Students from Missouri S&T will demonstrate the engineering principles of off-road vehicles by racing a student-designed and -built Baja vehicle during the Baja SAE (Society of Automotive Engineers) Maryland collegiate design series. The event will be held April 19-22 at Mechanicsville, Maryland, with racing happening at a nearby off-road track. This is the team’s first event for the season – it will also travel to the Baja SAE Kansas event later this summer. Missouri S&T’s Baja SAE Design Team will compete against approximately 100 other collegiate teams from around the world in a series of competitions, comprised of both presentations and races. Each team was tasked with building a vehicle prototype that could theoretically be selected for manufacturing and sold to the public. Teams will first give a formal design presentation to judges, along with a technical display and cost report. The race portion of the competition is split into five events. The events include a sled pull and tests of maneuverability, suspension and acceleration. The final event is a four-hour endurance race. The course will be riddled with obstacles the vehicles must avoid. Teams will be assessed penalties for infractions like poor or dangerous driving or being a hazard in any way while on the track. Missouri S&T’s vehicle, like all others competing, is powered by a 10 horsepower Briggs & Stratton engine that cannot be modified. Cars reach up to 40 mph on the course while climbing hills, fording streams and navigating through mud. S&T students have made their own CNC-machined transmission case, air shocks and steel chassis for the vehicle. The Baja SAE Design Team is one of 18 student-run teams in Missouri S&T’s Student Design and Experiential Learning Center (SDELC). The SDELC, housed in the Kummer Student Design Center, provides teams with computer design laboratories, a manufacturing shop, office space and logistical support. Design teams mirror small start-up companies that plan large-scale projects, organize into departments, raise funds, communicate their ideas and solve open-ended design challenges. Almost every team competes annually at an event against other collegiate teams from around the country and the world. For more information about the teams, visit design.mst.edu.